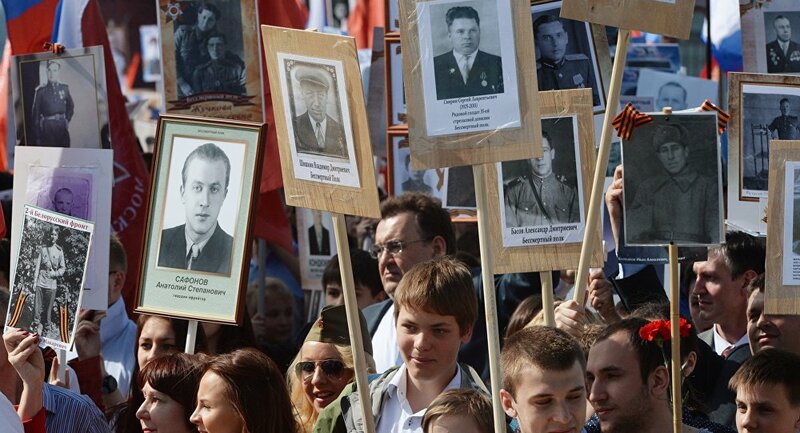 This year in Moscow, the Immortal Regiment procession is taking place on Tverskaya Street. The march will end in Red Square. It is expected that at least 800,000 people will take part in the march. Russian President Vladimir Putin also took part in the march. He led the column of people to Red Square. On May 9, 2015, the march down Tverskaya Street to Red Square in Moscow was led by Russian President Vladimir Putin, who carried a portrait of his father, a war veteran. According to official data, over 500,000 people took part in the Immortal Regiment march in Moscow alone. The number of participants across the whole of Russia exceeded 12 million. Andrew, an English teacher from Canada, who participated in the Immortal Regiment March, told Sputnik he was afraid that people may forget their history. "But there's still so much passion about this history, and I find it very humbling. I felt like people really do care about their country, their history, their culture. There was so much energy, it was so positive," he said. "People just want to celebrate what makes their country great. Other countries do celebrate [WWII heroes], but not necessarily in the same way. I think to have actual photos is the personal touch that helps make more of a connection and helps realize how many people really did die in the war. It makes it feel more real," Andrew told Sputnik. The Immortal Regiment-Moscow was registered as a regional patriotic public organization in March 2014. The movement runs an online Memory Book (over 150,000 biographies). The total number of participants reached about 180,000 in 2013 and grew to half a million the following year, as Immortal Regiment marches took place in more cities and villages, after which this civil initiative became part of the federal program of preparations for the celebration of the 70th anniversary of the victory in WWII.